October 1 2018 So far here in Key West its been a quiet tropical storm season. With the occasional low pressure pushing through giving us some rains and Easterly winds our weather has been pretty steady. September is traditionally the slowest month for fishing charters in Key West and we reflected that in our monthly average but still had a strong month for September here at Dream Catcher Charters. Moving into October with the last full moon behind us now the fishing is starting to heat up during the day on the reef and so are our charter numbers, its going to be a great month fishing in Key West. Loads of bait.. Got bait – yes! Bait means great fishing. Baitfish are the essence of life for the fish we love to go fishing Key West for. On the reef we are seeing massive amounts of ballyhoo. Kind of early this year but a welcome sight to us that love to fish for large yellowtail snappers, mutton snappers and grouper that prey on them from below. Lets not forget the awesome strike and blazing fast runs of the occasional cero mackerel and king mackerel (kingfish). Its all getting started early and I love it! Last week I took the crew out for some yellowtail fishing the day after a full moon. We knew the bite would be slower using artificials after a bright night moon but went anyway and still compounded on a nice catch and fun times. Large yellowtail snappers some mutton snappers and cero mackerel were the results of our effort as we moved our way down the reef fishing. Current was smoking but it was a nice day. Moving away from the full moon the catch has been getting really good on the reef and I expect it to get better. The yellowtail snappers are stacking up nicely in the shallower sections of the reef less than 70 ft of water and the incoming tide is working well for the guys who like to chum them in off the shallows. Using ballyhoo or anything cut bait will do the trick. We use nothing but artificials and focus on the larger fish that orbit the smaller schools, sometimes in as shallow as 25ft and whack the big guys. Looking forward this week I see that the winds are not going to let up, at least till the 8th of October. This is not a bad thing. 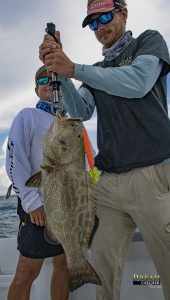 East and South East winds will certainly keep the Key West deep sea fishing bite going and the little bit of chop will keep the reef fresh with bait and keep those tasty little snappers happy. It is still grouper season till January here in the South Atlantic, Florida Keys Fishing and fishing Key West we are still working them daily. I prefer trolling for them this time of the year as part of my daily grind. Using the Repala X-Rap Magnum 30 and 40s trolling around the reef edges we target the black and red groupers. Its kinda tough sometimes with all the lobster traps on the reef this time of the year but we still manage to hook up some nice fish. In addition to grouper we have also caught some nice mutton snapper using the x rap Orange and Yellow. The fall is an amazing time to visit Key West. October especially with our amazing weather and incredible fishing all being met with cheaper hotel rates and more room to breath here in Key West. As we move into the fall it will be November before we know it. November reef fishing Key West is epic. Cooler waters usher in even more bait with even more predators such as wahoo and sailfish right up on and near the reef. Check out our Key West fishing Seasons Page for more details. All Round Lure to match the hatch Looks just like the baits we are seeing on the reef.